To be honest, I’m not a big fan of treadmill running. It’s just my personal preference, that’s all. But I get it – I understand why people use them. And, if using a treadmill is what gets you running, then, by all means, I certainly support it. While I, personally, may not enjoy using treadmills to run, I’m certainly not here to bash treadmill users. Instead, I plan to share how you can integrate treadmill running into your own training program. One of the most common running questions I’m asked is “should I or should I not run on a treadmill?”. In this episode, I explore the advantages and disadvantages of treadmill training and share some tips and workout ideas that you can use to help improve your running. Treadmills are the safest option when it comes to avoiding running in cold, hot, dark, or other dangerous conditions. Many hotels have treadmills in their workout rooms, which makes them a convenient option when traveling. Treadmills can help simulate warmer weather for those who live in cold areas but travel to race in hot climates. Treadmill deck surfaces are generally softer, smoother, and easier on your feet and joints. Most modern treadmills have a variety of workouts and features to help make your training more interesting. You can watch TV while running on a treadmill, which may help limit boredom while running. Running on a treadmill is not exactly the same as running outside. Foot strike tends to be shorter or more extended, depending on your comfort level on the treadmill. This variation in foot strike makes it difficult to maintain the same running form you have when training outdoors. When running on a treadmill, the belt somewhat propels you forward. In road and trail running, you don’t have this same momentum. On a treadmill, it’s easy to get distracted or lose focus by everything else that’s going on in the gym or on the TV. Because of this, you may sometimes forget to pay attention to your running form. Runners often pace surge and pull back when running on treadmills. By this, I mean they tend to twittle around with the speed controls and do not maintain a smooth rhythm. For many, treadmill running can be boring. This is more of a personal preference for each runner. Since treadmill deck surfaces are easier on your feet and joints, they can help soften the impact on your muscles, bones, and joints. However, this can come at a cost if take your running outside after primarily running indoors. Impact may create wear and tear, but you don’t always want to avoid it. When done in a careful and controlled manner, impact helps your muscles, bones, and joints become stronger. If you always run on a treadmill, your level of adaptation will be in relation to the level of surface softness you run on – in other words, when you eventually take your running outside, your body won’t handle the impact as well as someone who trains outside. So mix it up and try to get outdoors and run when you can. The calorie and metabolic equivalents of task (MET) calculations displayed on treadmills are estimated and usually not very accurate. Ignore these generic calorie calculations and, instead, go by miles, kilometers, minutes, or pace (Runners World has a nifty calculator you can use for this, if interested). However, if it motivates you to see the calorie counter go up on the treadmill, then feel free to use it as a scorecard but not a law. Try to minimize treadmill training to the worst of days – like when it’s raining hard, dangerously hot, or too dark out. Do your best to get a couple of outdoor runs each week. Variations of terrain, cambered roads, and harder running surfaces all play into building strength and endurance in your supporting muscles. Be aware of your form. Just like any type of running, when you run on a treadmill, you create repetitive impact on your body. While more forgiving, repetitive injuries can still occur on treadmills. When you run, always have a mind-body awareness going on that focuses on your form. If you can’t run without holding onto the treadmill then you need to slow down. Take a step back and work yourself back up to a speed that you feel confident using. Things like balance and spacial perception (that awkward feeling of how you’re moving but nothing around you is) can take time to get used to. If you’re just getting started on the treadmill, keep your workouts simple. Don’t get fancy and try things like intervals, sprint-ladder style workouts, or hill workouts. Just get comfortable with the machine and your running. Once you’re comfortable, you can then try to add a little pizzazz to your workouts. Always warm up and cool down. This goes for outdoor running too. While many runners skip this step, the warmup and cooldown phases are a huge preventative maintenance factor that can keep you healthy and injury free. Always think safety first! Do you want to know what not to do on the treadmill? Go spend some time on YouTube looking at treadmill accidents – it’s some scary stuff. Motors and tread surface can rip off your skin and break your bones. There are hundreds of workouts you can do on the treadmill. Many of these are novelties and more for addressing the boredom factor than something you would incorporate into your training program. What treadmill workout you should try really depends on your experience level and what your training goals are. If you’re just trying to get some exercise, then your options are endless. If you’re, instead, using a treadmill to as part of your race training or are just bringing your regular run inside, do what you would normally do as if you were running outdoors. The Seinfeld Workout (aka The Sitcom Workout) – Basically, the idea is that you do intervals at 10 seconds faster than your 5k race pace during the commercials, and then run your normal training pace during the show. As you improve, try swapping the order so that you’re running at your interval pace during the show and recovering during the commercials. Just remember to avoid the trap of watching the TV show so closely that you forget about your form or intensity level. Hill Repeats – Start at a 4% incline and work your way up to a 7% incline by doing repeats. Start with a 60 second on, 120 second off approach and repeat until you can complete 15 cycles. You may not be able to do 15 cycles at first and that’s OK. Once you can, jump to a 5% incline and repeat, then a 6% incline, then 7%, etc. As you improve, you can also lengthen your “on” cycles and shorten your “off” cycles, but always maintain some level of recovery in between your intervals. Sprint Ladders – This interval workout involves running each interval slightly faster than the one before it. Start with short intervals and slow down with a recovery interval between each interval cycle. As you improve, you can lengthen the interval time. Be careful to always maintain good form – if you can’t maintain good form, you are going too fast. Again, these are just a handful of examples to give you a few treadmill workout ideas. You can find plenty more by simply searching on Google or YouTube. 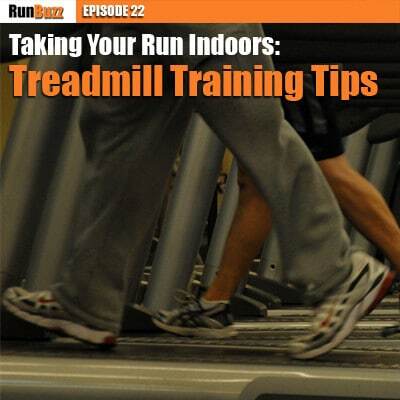 Share RunBuzz treadmill tips with friends!